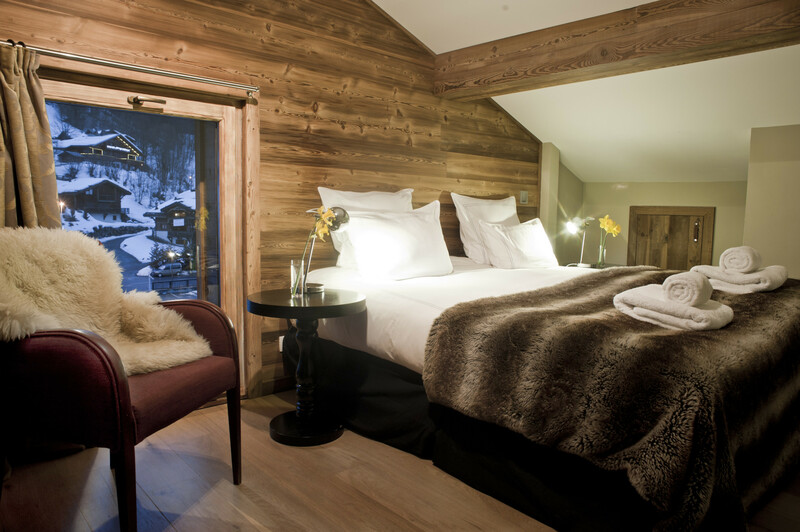 The Chamois d’Or is home to 14 en-suite bedrooms and one penthouse with four en-suite bedrooms and a fully-equipped living area. Blending traditional alpine charm with contemporary design, our rooms provide a welcoming sanctuary created with comfort and luxury in mind. A night in the Chamois d’Or would not be complete without curling up in a signature bathrobe and slippers, before settling into the softest Egyptian cotton sheets. Bringing new meaning to “a room with a view”, our Penthouse apartment atop the hotel is an exercise in light and comfort, providing magnificent vistas of the surrounding mountains from an opulent suite with alpine character. It has four bedrooms, sleeping up to 9 guests, who can enjoy the exclusivity and flexibility of their own private lounge, a well-equipped kitchen and a dining area. Two ensuite bedrooms with king size beds or twin beds. Two additional bedrooms with twin or triple beds. One bathroom with separate shower and bath. Outstanding views of the surrounding mountains. Fully equipped kitchen with dishwasher, cooker, hob, microwave, fridge/freezer, wine fridge and Nespresso coffee machine. Living and lounging space with dining table and chairs. Wake up to a delightful breakfast of warm croissants and freshly brewed coffee and wide variety of both hot and cold options to set you up for a day on the slopes. 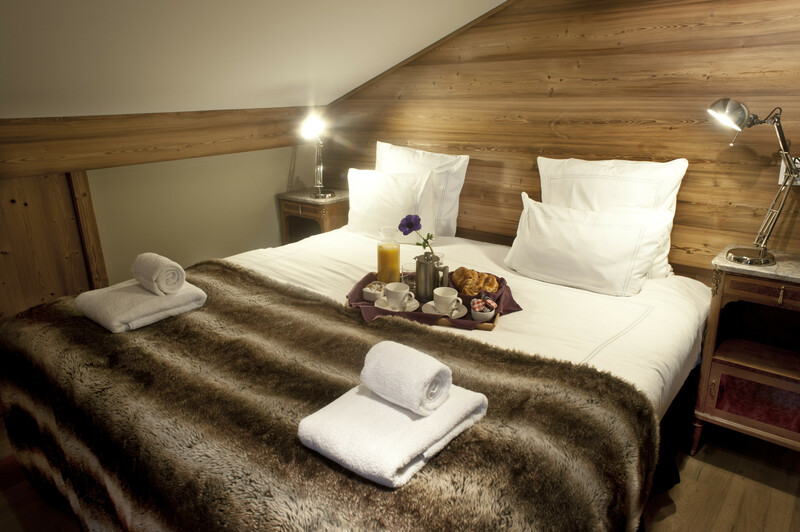 Our beautiful hotel is situated in enviable position in close proximity to most of Les Gets wonderful restaurants. The knowledgeable reception staff will be happy to recommend and book you a table in a restaurant of your choice. Hotel guests are welcome to reserve a table in the restaurant to eat ‘à la carte’, or we’re also happy to help you make reservations at the other great restaurants Les Gets has to offer. New for this coming winter season, constructed entirely from 200 year old timbers, copper and cow hides the bar will entice you with its beguiling charm and soul. The Chamois d’Or is home to the Les Gets Luxury Spa. 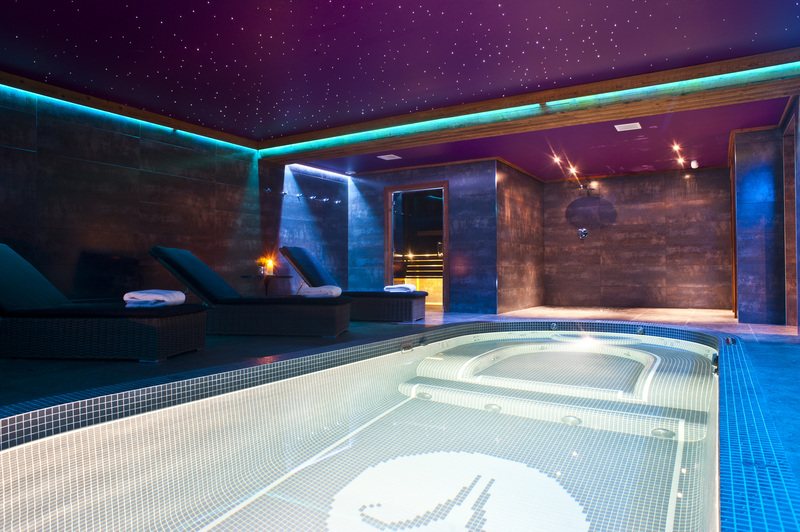 Enjoy a hot stone massage, plunge into the swimming pool or simply lie back under the glistening starlit ceiling. Experience bliss in the bubbling jet pool, take some time out in the therapeutic hammam or drift into the sauna for a purifying, dry heat experience. Our team of specialist therapists and sports masseurs are ready to revitalise your body, relax your muscles and calm your mind. Escape and unwind amidst the purple hues, tranquil lighting and stylish décor of our two purpose built treatment rooms. Sodashi is an Australian skin care company that has successfully harnessed the benefits of natural ingredients to produce effective, chemical-free skin care products and spa therapies. Catering to both men and women, the extensive range of Sodashi products are formulated using a unique combination of biochemistry, aromatherapy and Ayurvedic principles. Your skin is as unique as you are. At Les Gets Luxury Spa, we will treat your skin with that very uniqueness, following your facial you will feel rejuvenated and radiant. Whether you are feeling sensitized, dry, oily or just need a deep cleanse, all of our facials are customized to treat your specific skin care concern. Facial cleanse and exfoliation with our berry scrub to remove dead skin cells. Reduces appearance of fine lines and tightens pores. Providing a fresh, tighter, brighter youthful skin. Ease away the stresses of daily life with a relaxing facial, scalp, neck and shoulder massage. Enjoy a detoxifying cleanse followed by a deeply purifying mint clay mask. A truly relaxing experience. Commencing with a salt therapy back massage that eases stress and tension in the mind and body, the face is deeply cleansed and exfoliated to balance the skin’s natural oils and assist in preventing in-growing hairs, leaving your skin soothed and relaxed. Concentrating on the delicate area of the eyes, incorporating pressure point massage and a collagen eye mask, this treatment helps detoxify, reduce puffiness and combat fine lines. A perfect add on to any facial. Les Gets Luxury Spa have teamed up with Morzine Massage to offer you the best in massage and reflexology should your muscles need a little attention whilst staying in the mountains. Massages vary greatly, which is why we have a range of qualified therapists to provide the best treatments for your needs. Only our team of highly qualified sports massage therapists will provide the deep tissue massages to ensure your muscle knots are addressed and rectified. Only our experts in Indian head massage and aromatherapy will provide these treatments. For all other massages, our team have had extensive training and experience, so you’ll be in safe hands for a very enjoyable treatment. This treatment is designed to alleviate stiff, tired and overworked muscles after a day of outdoor activities. The deep tissue massage is delivered by a highly trained sports massage therapist who knows how to hit the spot by penetrating through the layers of tissue, to provide the relief your muscles crave. Next, experience a deeply soothing foot massage followed by massage of the hands, neck, and shoulders. Finally, finish your treatment with a pressure point scalp massage. A full body massage that focuses on the deeper layers of muscle tissue. This truly is a great treatment to relieve acute tension, muscle knots and aches and pains. Using light to medium pressure, this full body massage brings together a variety of techniques to relieve tension, soothe fatigued muscles and calm the body and mind. You will be massaged with essential oils derived from plants, which are believed to be absorbed through the skin. Each essential oil has different healing properties; some calm, whilst others energize. The massage will be bespoke according to your needs and mood on the day. A deeply relaxing head, neck and shoulder massage incorporating pressure points to release tension. Ideal for easing headaches and stress, or simply for switching off. This massage can help relax the body’s muscles and soft tissues, alleviate pain, improve circulation and help rid the body of toxins. The hot stones also help reduce stress, promote calmness and increase relaxation. A bespoke massage sequence to leave you feeling relaxed and re-energised, focusing on your trouble spots. A specific massage sequence to leave your legs feeling relaxed and re-energised. You’ll be ready and raring to ski, snowboard, randonee or snowshoe the next morning. The feet and lower legs are expertly massaged by a qualifies Reflexologist (AOR). Pressure points on the feet are worked on to stimulate every part of the body, this in turn unblocks the energy pathways allowing the body to heal and re-balance itself. A very relaxing and powerful treatment and a great treat for the whole body. Lay back and relax while you are cocooned in soft pillows, and allow the therapist to work their magic on your tired body. You will feel relaxed and revived at the end of this sumptuous treatment. Revitalize your skin and stimulate your senses with Sodashi’s all-natural scrubs. A treatment using warm soothing oils, Himalayan salt and plant essence. Relieves stress and fatigue while gently stimulating the body’s circulation. Ideal after long periods of travel or exercise. Enjoy these pampering hand and foot treatments to leave your nails looking glorious and your hands and feet feeling soft and smooth. The most decadent of hand treats. Begin with a relaxing soak for your hands before we begin your cuticle and nail work. A sugar scrub exfoliates and removes any dry skin. A luxurious olive oil and lemon balm is applied and then your hands are wrapped in hot towels to allow the balm to work it’s magic. Whilst this is happening, enjoy a relaxing scalp neck and shoulders massage. We finish your treatment with a polish of choice. We begin with nail filing and cuticle work, followed by a light moisturising with our beautiful Sodashi Hand Rescue Cream leaving hands silky and smooth. The final touch is your choice of polish. The most decadent of feet treats begins with a beautiful soak of your feet before we begin your cuticle, nail and foot work. A sugar scrub exfoliates and removes any dead skin cells. A foot balm is applied and then your feet are wrapped in hot towels to allow the balm to work it’s magic. Whilst this is happening, enjoy a hand and arm massage. We finish your treatment with a polish of your choice. A foot bath with essential oils will have your feet relaxed before we file and buff your toenails. This is followed with a cuticle treatment. A light leg and foot moisturising with our Sodashi Mint Soother will leave you feeling recharged and revived. The final touch is your choice of polish. Soothe and revitalise tired, sore feet with Sodashi’s invigorating seas salt polish to refresh the skin and stimulate circulation. Sodashi’s mint foot cream with oils of arnica, lavender and peppermint, is massaged into your feet and lower legs to provide total relaxation. The length of hair to be removed should be no shorter then ¼” in length, (removal of longer hair can be painful), ¼” is ideal. We suggest maintaining your treatment by pre-booking every four to five weeks to allow for the correct re-growth length.